For thousands of years in Europe there were two main spiritual paths... Witchcraft and Druidry, , it was here and now spirituality found with the Land, the Moon and the Sun of our European zone. Witchcraft and druidry may seem like separate paths but they actually come from the same root or trunk. It can also be quite helpful to see the two paths as; witchcraft following the Moon and druidry following the Sun. Witchcraft connects with nature in much the same way as druidry does and we could even say that witchcraft and all its magical arts fits quite well into the ovate (natural world) grade of druidry. Druidry has three grades, the first is the bard grade, this is where one can discover their creative potential, be it story telling, learning music, playing an instrument, poetry or dance. It combines creativity with the ancient myths of the Celts, Saxons, Vikings and bronze age period. The next grade is that of the ovate, and on this level one would find themselves being attracted and communing with the natural world to learn about the true energy of trees, herb/plant lore & advanced natural positive magic. The final grade is that of the druid itself, this is after some time, usually many years, when the seeker has accumulated knowledge and through the experience and practical application of that knowledge the inner wisdom then starts to arise. These three grades are intertwined and forever flowing in and out of each other, some seekers choose to stay as bard, following the music or poetry, others like the crafts of the ovate level and stay on that grade as healers or herbalists, while others get the calling to become a fully fledged druid. The druids are one of the most mysterious cultures, discussed in literature and folklore, and strangely enough they never kept a single written record of their druidic society. They were thought to be descended from the ancient Celts, who had a written language but rarely used it. The story of the druids has been passed on through word of mouth and from literature of Greek and Roman authors, who bumped into them during the expansion of the Roman Empire. The first written description of the druids is in Julius Caesar's Commentary de Bello Gallico, published around 40B.C. Caesar noted that druids were one of two respected classes in Celtic society, functioning as judges, philosophers, teachers, healers. He claimed they performed magical rituals including human sacrifice. This was very inaccurate and was part of a christianised propaganda scheme... aimed to discredit and cast a negative light on druidry. Up until this day there has never been any archeological evidence regarding human sacrifice and druids. Many historians of today believe Caesar's image of the druids may reflect his own desires to justify his conquest wars by creating a barbaric people deserving conquest. Often in Roman literature, the druids are referred to as the "barbaric philosophers". The root of this hatred may have started many years before the Roman invasions of England, it could well have started with tribes from what is now as Austria and Bavaria, heading south of the Danube river into Italy and plundering Venice and Rome!. Eventually the Roman leaders got fed up with it all and organised a huge army to march out of Rome and convert Europe! So the ancient druids were revered as holy priests and priestesses able to commune with spirits were very much respected. The life of the ancient druid was not such an easy one. The study often took twenty years as it was passed down word to mouth and bound to memory. Although druids are commonly equated with priests of the Celts, some historians believe that they operated not as a mediator between man and God (as of todays priest), but as more like shamans guiding and directing ritual and communing with different dieties. Probably the most important aspect of druidism, is the belief that the soul does not die, but is passed into another form(reincarnation) to a deeper or the next level (the afterlife) and so on until the soul reaches the source. Once the source has been reached the soul was then ready to be reborn into another person. So strong was this belief that those who followed the druidic way would go into battle fearless, knowing that their soul would remain unscathed. In recent times druidry has become popular and has managed to set itself up quite professionally most noticeably in England. 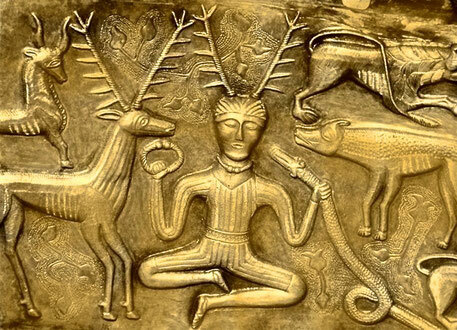 Modern druids cannot be compared with the ancient druids, and let it be said, todays modern druids have no direct connection to the druids of the Iron Age. Many of our popular ideas about druids are unfortunately based on the misunderstandings and misconceptions of scholars 200 years ago. The origin of the title ‘Druid’ is unclear, but it may come from the word ‘doire’, an Irish-Gaelic word for oak tree (often a symbol of knowledge), also meaning ‘wisdom’. Druids were very interested with the natural world and its powers, and considered trees sacred, particularly the oak. Its been a hard time for witches over the last five hundred years or so. Witches and witchcraft since the witch trials not so long ago where thousands of witches were wrongly sentenced to torture and death are still going through a torrid time. Witches usually end up being the evil ones in films and books, although saying that witchcraft is not evil, its a path of life. It is a path with the upmost respect for nature. Nowadays witchcraft is usually termed as wicca (old English term for witch). Its an Interesting term and it takes away all the negative stereotypes that society has given the word witchcraft. Wicca is quite similar to Druidry, it also has three levels of training, which are known as; the outer teachings, the inner teachings and the secret teachings. The outer teachings are the introduction to the seasonal year or wheel of the year, and its eight festivals, the God and Goddess and the Sun and Moon phases throughout the year. The inner teachings occur when the one has traveled around the ritual year and wants to take things deeper. With the knowledge and wisdom that has been accumulated through the turning year/s its then time to move onto a different journey, a journey that gives rise to deep inner wisdom. The secret teachings are not totally secret, they are simply called that because when someone has been walking this path for some time... an inner knowing eventually arises. Its this unspoken world, this deep wisdom that becomes the bedrock of the witches practice. Its the place that supports the being and gives vital energy, its a place of unspoken magic of the otherworld flowing through us. Its not possible to reach these deeper levels with modern day workshops and courses, whether it be yoga, channeling or the chakras. This depth also cannot be found jumping from one workshop to the other in the hope of the more the better, it can only be found staying on ones own path with the natural world around, preferably balanced with the wheel of the year. Its quite plain to see that both paths druidry and wicca are very similar and both rely on a deep respect for nature. Both paths are Pagan based (country ways/folk) and are a part of every one of us here today. Witches and druids can be as different as birds in the sky, some concentrating on healing, others music others inner world communication. Looking like normal people in the street but having some secret successful art on the side. What binds all these together is their love of nature and the connection with the life enhancing vibrations of the natural world. Nature gives us everything we need for survival and carries us through life, but very few of us stop and thank the trees or smell the aroma of the flowers, or see the wind on the corn, or take time to watch the birds or enjoy the blessing of the rain. If one does learn to slow down and become more conscious and notice and thank nature in a respectful way; this little beneficial act creates a connection, creates positivity and induces more consciousness to the seeker and underlining it all it brings an opening and an interval in life for the divine to enter us and deepen our love to all living beings.